Paradise Papers: Trump’s commerce secretary Wilbur Ross has ties to Putin cronies. 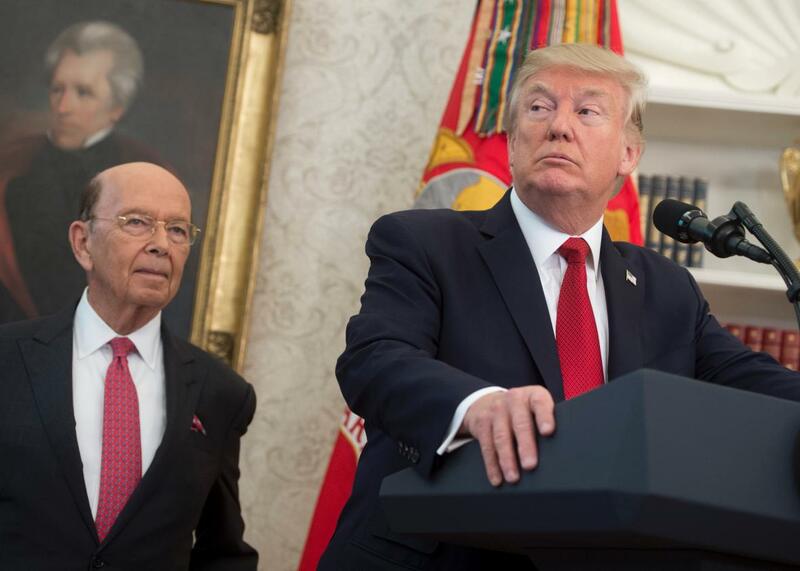 President Donald Trump speaks alongside Secretary of Commerce Wilbur Ross about his tax reform proposal in the Oval Office of the White House in Washington, D.C.
Looks like it’s Panama Papers Part Two. The non-profit International Consortium of Investigative Journalists began publishing on Sunday what it is calling the Paradise Papers. More than a year after the organization’s network of journalists around the world shook up politicians in several countries with leaked data on offshore havens, another trove of documents taken from a Bahamas-based firm promises to expose how companies and the wealthy use complicated structures to skirt taxes. Most of the more than 13.4 million documents, which were analyzed by a group of more than 380 journalists in 67 countries, are from Bermudan law firm Appleby. Among the most explosive revelations so far involves news that Commerce Secretary Wilbur Ross shares business interests with close allies of Russian President Vladimir Putin, which he failed to fully disclose during confirmation hearings. The documents show Ross continues to have a significant interest in a shipping firm that has a Russian energy company as one of its main clients. The owners of that company include Putin’s son-in-law and an oligarch under U.S. sanctions. The stake in the firm is held in Cayman Islands, just like much of the commerce secretary’s massive wealth that has been estimated at more than $2 billion. Lawmakers who were part of Ross’ confirmation hearings say they feel duped. During the process, Ross was asked about his ties to Russia and his investment in another shipping company, but Navigator never came up. Sen. Richard Blumenthal from Connecticut told NBC News that the general impression was that Ross had gotten rid of his stakes in Navigator, and they didn’t know about the firm’s ties to Russia. “I am astonished and appalled because I feel misled,” Blumenthal said. “Our committee was misled, the American people were misled by the concealment of those companies.” Ethics experts say that even if there is nothing illegal about the arrangement, it still raises several ethical questions because one of the lead voices in the administration’s trade policy could make money from business with Russia. Ross is hardly the only Trump associate to have ties to offshore companies. In fact, the ICIJ investigation found that several key members of the administration and Trump allies, including Secretary of State Rex Tillerson, were named in the files from the Bermuda-based company. There is no evidence that any of them did anything illegal. The leaked documents also reveal how the Kremlin made substantial investments in Twitter and Facebook through a magnate who is now a business associate of President Donald Trump’s son in law, Jared Kushner. There is no evidence that this is in any way linked to Moscow’s efforts to influence the 2016 election through the social networks but it does illustrate how “the Kremlin has extended its long financial arm … to some of America’s technology giants,” as the New York Times puts it.